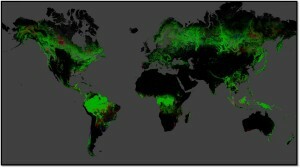 A team of scientists led by Matt Hansen at the University of Maryland analyzed free data from the Landsat 7 satellite to map changes in forests from 2000 to 2012 around the world at local to global scales. View the USGS press release. Nov 13, 2015 • [By Jon Campbell, USGS] Since late 2008, when Landsat earth observation images were made available to all users free of charge, nearly 30 million Landsat scenes have been downloaded through the U.S. Geological Survey portal – and the rate of downloads is still increasing. That’s a lot of free data about the state of the planet. But what is it worth? How valuable can something free possibly be? The worth of many things is related to scarcity. If there are too many houses or diamonds, bushels of corn or barrels of oil for sale, the price for these items falls. A free market determines the market value of what we might hope is a $500,000 house or a $5,000 diamond. The concept of market value breaks down for goods and services that society has determined should be freely available to everyone. Free data for earth observation fits into this category. It is a public good ­– along with public education, public roads, and public parks. While these services are not actually free (they are, of course, funded with public money), we know that the broad use of such services benefits all of society so the cost to each individual user is largely borne by all. The Department of the Interior’s policy of releasing the full Landsat archive at no cost allows researchers around the world in government, in the private sector, and at universities and institutions to generate even more data applications that are good for society. These purpose-driven data applications – known on mobile devices as “data apps” – can serve commercial endeavors in agriculture and forestry; they can enable land managers in and out of government to work more efficiently; they can help us define and address critical climate and environmental issues. In the United States, the federal government invests about $3.5 billion annually in civil earth observations and data (including Landsat and other satellites, weather, GPS, etc.) across multiple agencies, while optimizing related investments that are also made by state, local and tribal governments, academia, and industry. The information derived from earth observations supplies the foundation for scientific advances in many fields and enables multiple federal agencies and partners to carry out their missions. Federal investments in various aspects of earth observation are conservatively estimated to add $30 billion to the U.S. economy each year by providing Americans with critical knowledge about natural resources, climate and weather, disaster events, land-use change, ecosystem health, ocean trends, and many other earth-related phenomena. The U.S. Geological Survey, a bureau of the Department of the Interior, is a major contributor to civilian earth observation through its support of the Landsat mission in partnership with NASA. First launched by NASA in 1972, the Landsat series of satellites has produced the longest, continuous record of Earth’s land surface as seen from space. Landsat images spanning four decades have been used by scientists and resource managers to monitor water quality, glacier recession, coral reef health, land use change, deforestation rates, and population growth. To give a few examples of Landsat’s many commercial applications, Landsat data have been used to track the use of irrigation water, to assist drought-stricken California grape growers, and to contribute to the success of a forestry start-up company. As an indication of widespread public interest in Landsat data, third party avenues to the data and innovative ways to use it are available from Amazon, ESRI, and Google. Fundamental knowledge of the land and its resources is a basic need for effective government and a productive economy in any nation. More than 30 countries and geopolitical groups now have earth observing satellites, reflecting a wide range of national priorities around the world for environmental monitoring and economic growth. At the same time, more countries are adopting policies of full, free, and open data for earth observation, whether the observation operations are conducted by their national satellites or whether the data is shared between countries and with the public. In Rwanda, for example, the government has developed and used open data to support national land use planning via their National Land Use Portal, which provides transparency collaboration and cooperation among many different partners to help shape a more sustainable future. Brazil, a co-leader of the Open Government Partnership in South America, provides its citizens the opportunity to participate in the planning and development of public policies by providing government data on hydrography, transportation, energy and communications, and more, through their Brazilian Portal of Open Data. Three recent announcements illustrate a growing global trend for sharing earth observations across national boundaries. On November 13, U.S. Secretary of the Interior Sally Jewell, leading the U.S. delegation to the 2015 Ministerial Summit of the Group on Earth Observations (GEO), signed an agreement with Mexico that served as a regional milestone for international cooperation in using land-surface satellite data in promoting sustainable land management. The Memorandum of Understanding will enable Interior’s USGS to give Mexico’s National Institute of Statistics and Geography (INEGI) direct reception of U.S. Landsat 8 satellite data. On October 19, the United States and the European Commission signed an agreement on Copernicus Cooperation. The European Copernicus Program has adopted a policy of free and open data from its Sentinel series of satellite missions, helping make Europe a world leader in the implementation of free and open data policies. On June 18, in Canberra, Australia, the USGS and Geoscience Australia signed a comprehensive new partnership to maximize land remote sensing operations and data that can help to address issues of national and international significance. The partnership will include a strong focus on applying new science and ‘big data’ techniques, such as Geoscience Australia’s Geoscience Data Cube and the USGS land change monitoring capability, to help users unlock the full value of the data from the Landsat program. In preparation for the upcoming international climate talks in Paris, Secretary Jewell has emphasized the critical importance of data sharing as a foundation for global action on climate change. This entry is filed under Data, Landsat Value, News.